Deep in the south of Spain and just a stone’s throw away from Morocco is Andalusia. A region peppered with rolling hills, unspoiled coastline, snow-capped mountains and winding rivers. Although it’s not just the landscape here that’s diverse, it’s the history too. Ruled by the Moors for centuries, you can still feel their strong Islamic influence in the ornate architecture and delicious food. Spain as a nation is known for its lively tapas bars, seafood-spiked paellas and fruity sangria, but Andalusia puts a local spin on its cuisine. 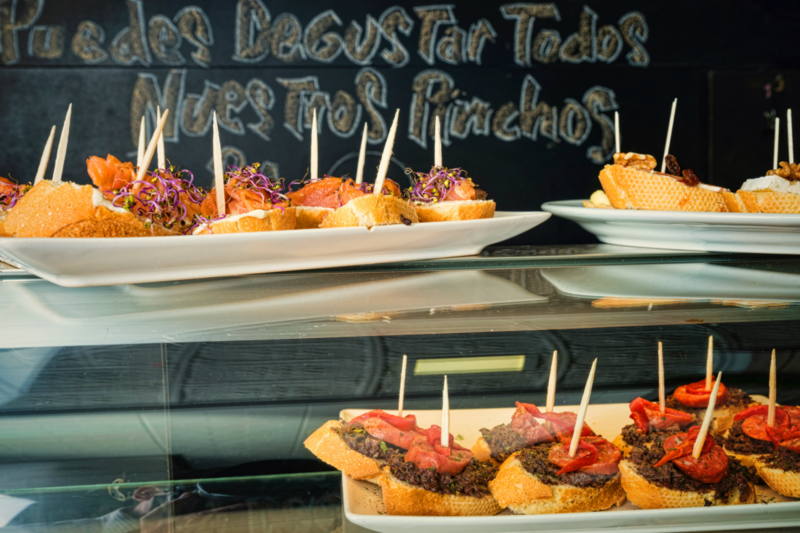 Allow me to introduce you to eight traditional plates that’ll have you packing your bags for southern Spain straightaway. Dating back all the way to the Moorish Middle Ages, ajoblanco is sometimes described as the elderly relative of gazpacho. Made by softening stale bread in water and vinegar, blending with nuts and seasoning with plenty of garlic. Despite the dish’s name (ajo meaning garlic), the key ingredient in this recipe is the almonds due to the abundant crop available in Andalusia. This rich, creamy soup is served cold, drizzled with olive oil and garnished with grapes, raisins or cucumber. Not to be confused with gazpacho, salmorejo is a slightly different variation on the world-famous chilled tomato soup. Created from a simpler recipe using only tomatoes and garlic, as opposed to gazpacho which combines onion and pepper too. Salmorejo has a thicker consistency because it’s mixed together with bread, and so is usually served up in a bowl topped with jamón and a boiled egg rather than sipped from a glass like gazpacho. Seeing as many cities in Andalusia are on the coast, seafood remains a constant theme throughout. Coquinas, a type of tiny and delicate clam, are found along the shorelines of Huelva and Cadiz. They’re prepared in much the same way as French mussels, with lots of garlic, butter, parsley and a generous glug of white wine. You’ll find them being served in large bowls with their shells on – be sure to ask for a side of warm crusty bread to soak up the sauce with. Literally translated as fried little fish, this snack does exactly what it says on the tin. 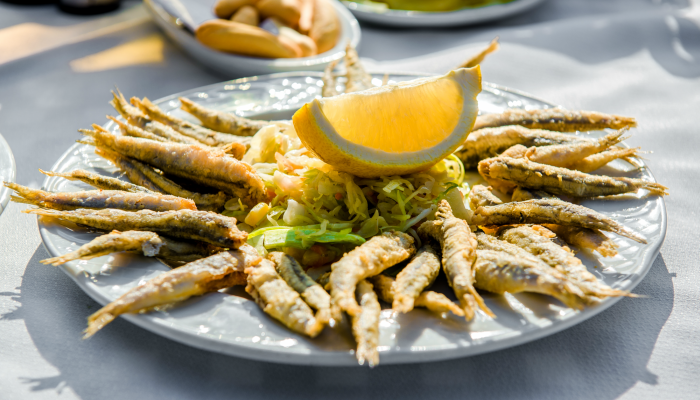 Made using the freshest white fish, such as small white anchovies, seasoned with salt and lemon, coated in flour and then lightly fried in sunflower oil until golden brown. If you imagine that these tasty morsels are as important to the Andalusians as paella is to the Valencians, you start to get an idea of how well-loved this treat truly is. Puntillitas, or deep-fried baby squid, are also a real regional delicacy. If you’re after something sweet, a pionono is sure to hit the spot. These bite-size pastries are native to Santa Fe, a town near Granada, and get their name from Pope Pius IX. They’re formed of two parts: a round pastry bottom soaked in sweet liqueur and topped with a toasted cream. You’ll find some of the best piononos at Rey Fernando café in Granada, where they’ve been serving up these sugary goodies since 1945. Aside from the classic flavour, they also offer strawberry and chocolate versions. Long-standing foodie favourite jamón ibérico, or Iberian ham, is a cured meat predictably produced on the Iberian Peninsula. 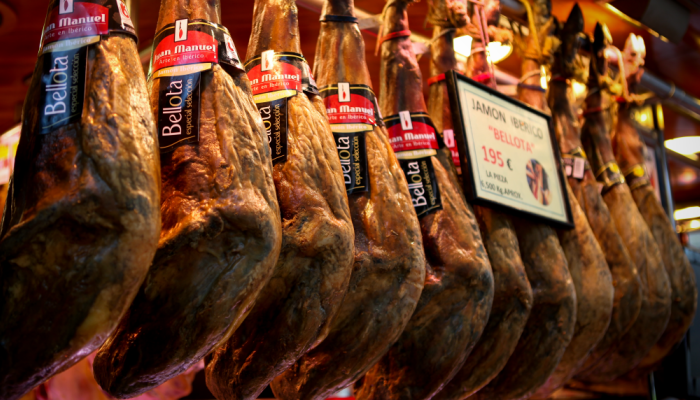 In order for jamón ibérico to be classified as such it needs to be made from black Iberian pigs only found in certain parts of Spain and Portugal. Huelva is a perfect place to try a few slivers of this marbled meat, alongside a lovely glass of Spanish sherry. Jamón slicing is something of an art too, the knife used to cut it has to be extremely sharp to carve the wafer-thin slices. Revisiting the sweet theme, polvorones are a kind of mantecado, a variety of Spanish shortbread. Polvo means powder or dust, which would make sense as these biscuits possess an incredibly crumbly consistency. They’re typically baked in factories across Andalusia but were originally brought to Spain by the Moors. Made from flour, milk, sugar and nuts (commonly almonds), you’re likely to spot them popping up all over the place around Christmas time. 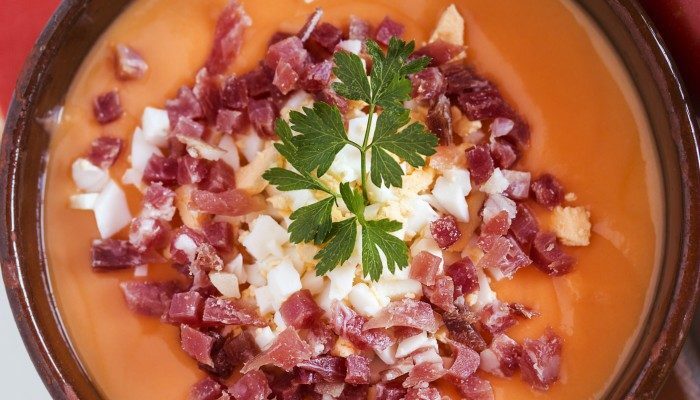 Flamenco-style eggs, or huevos a la flamenca, come from Andalusia – not surprising when you consider it’s the spiritual home of flamenco dancing. Created by baking eggs in ramekins filled with a thick tomato sauce that’s packed full of delicious Spanish ingredients like chorizo, Serrano ham, smoked paprika and pimentos. 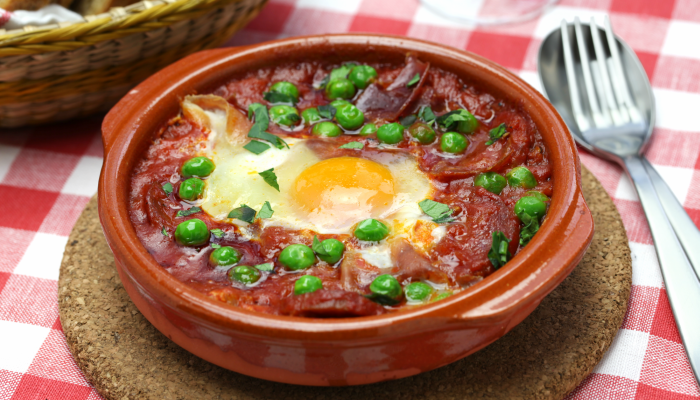 Although we commonly associate eggs with breakfast, you’ll typically find this being dished up at lunchtime in Spain. Now trust me when I say that this is just the tip of the iceberg when it comes to the delights of Andalusian gastronomy. Because in Andalusia it’s not just about the food, but the drink too. Make sure you sample a few of the region’s specialities, including sherry from Jerez, vino de naranja (or orange wine) in Seville and tinto de Verano (or summer wine) on the coast of Nerja. Eager to explore the Iberian Peninsula? Do it in style on a Peregrine Adventure Cruise along the coasts of Spain, Portugal and Morocco.